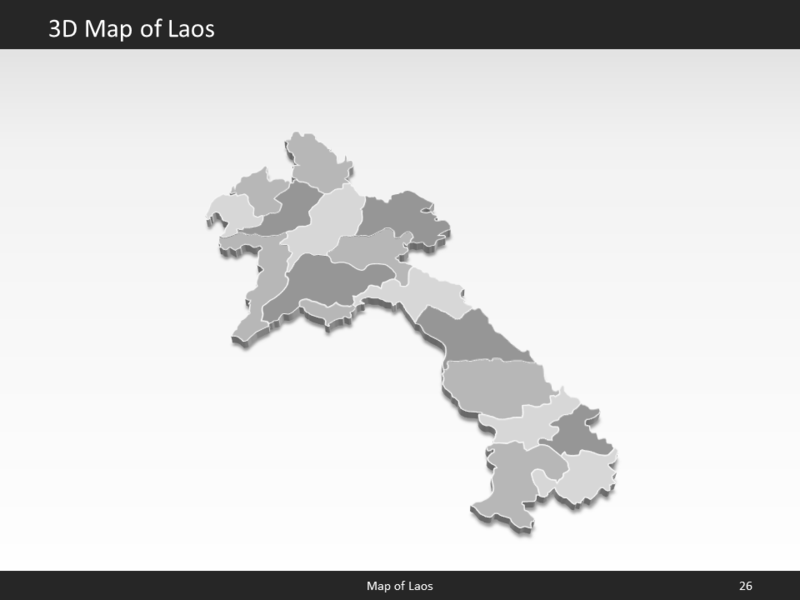 Premium PowerPoint Map of Laos. This detailed PowerPoint Map Template shows Laos states, biggest cities and the Laos state capital. 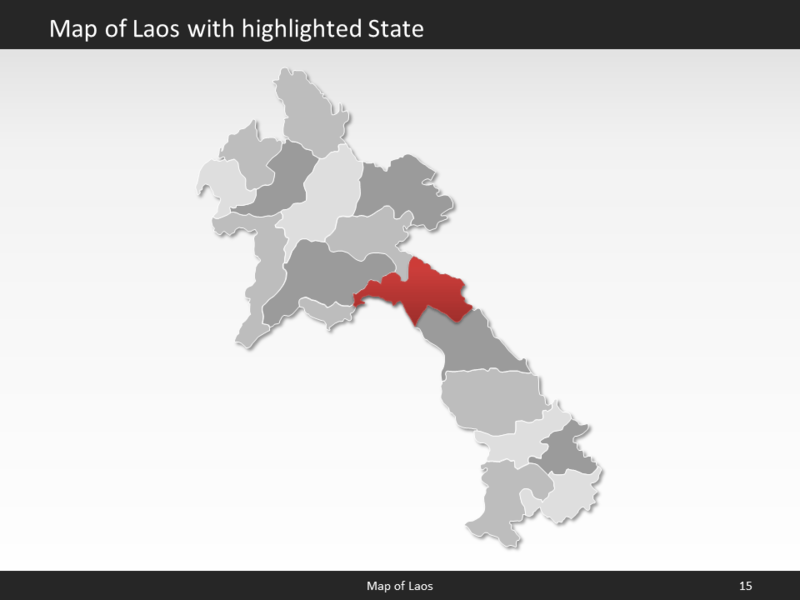 The Laos PowerPoint Map is hand drawn and fully editable in size and color. 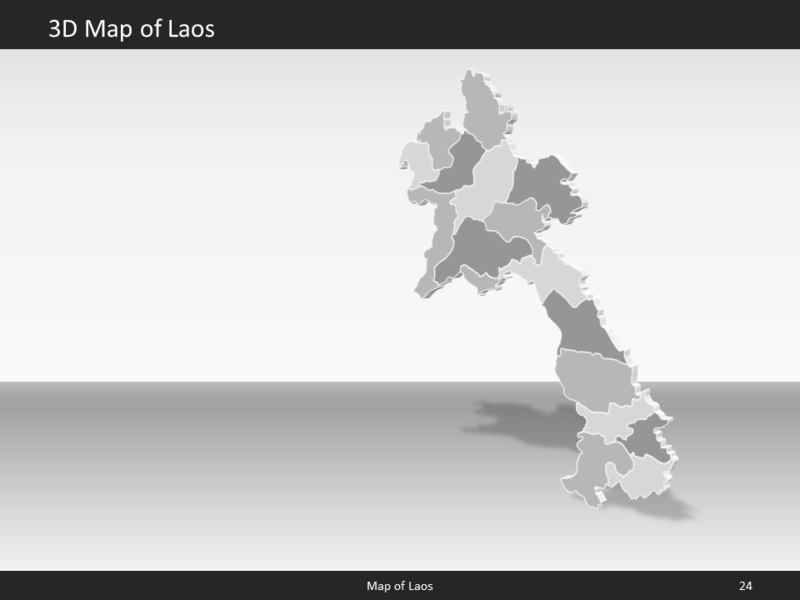 Premium PowerPoint Map of Laos. This detailed PowerPoint Map Template shows Laos with states names and biggest cities including the Laos capital.The Laos PowerPoint Map is hand drawn and fully editable in size and color. Every state can be extracted simply. We guarantee that all our products work with Microsoft Office more recent than Office 2003. 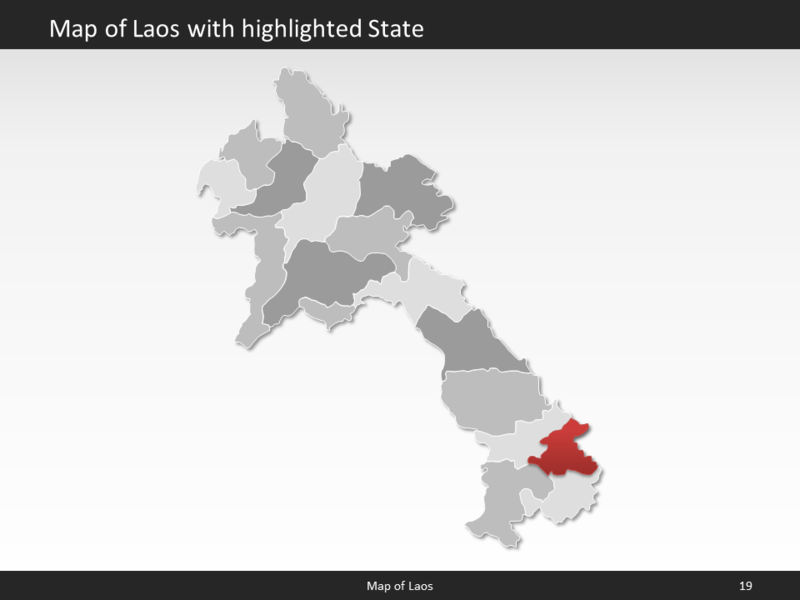 You can work with our maps and shapes not only in PowerPoint but likewise MS Word and MS Excel. All files even work on Office for Mac. Only the Selection list add on is not supported by Office for Mac. 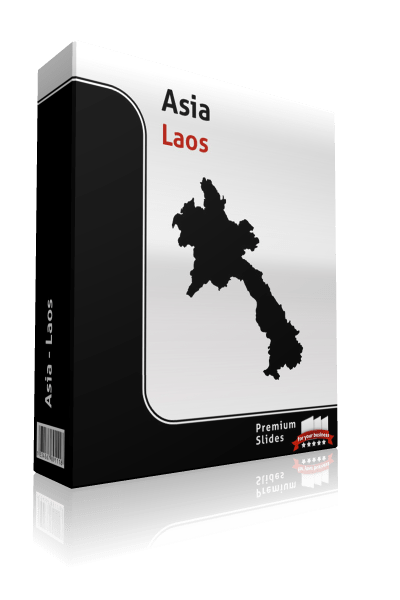 You do not need any new plugins or any other software! Just start PowerPoint and work straight away. 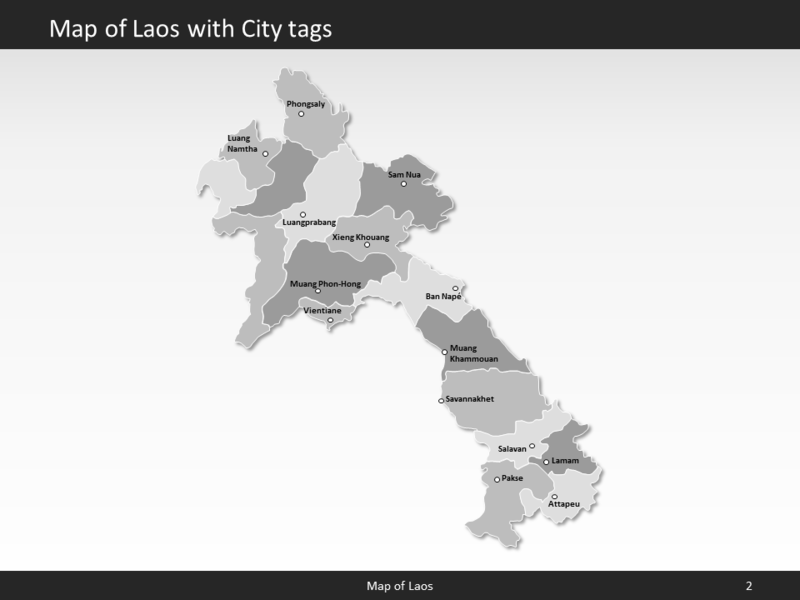 You can download your bought map files and slides instantly after purchase. 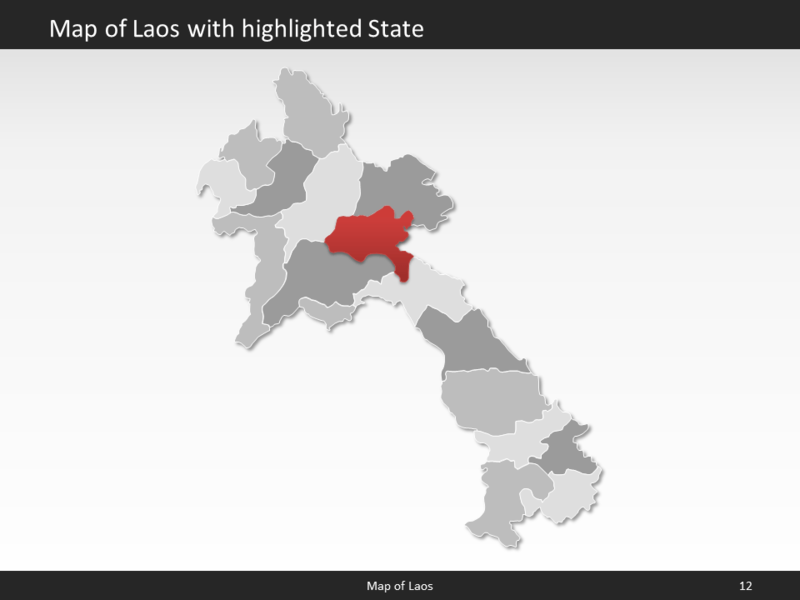 Facts and information about Laos you can use in your presentation. 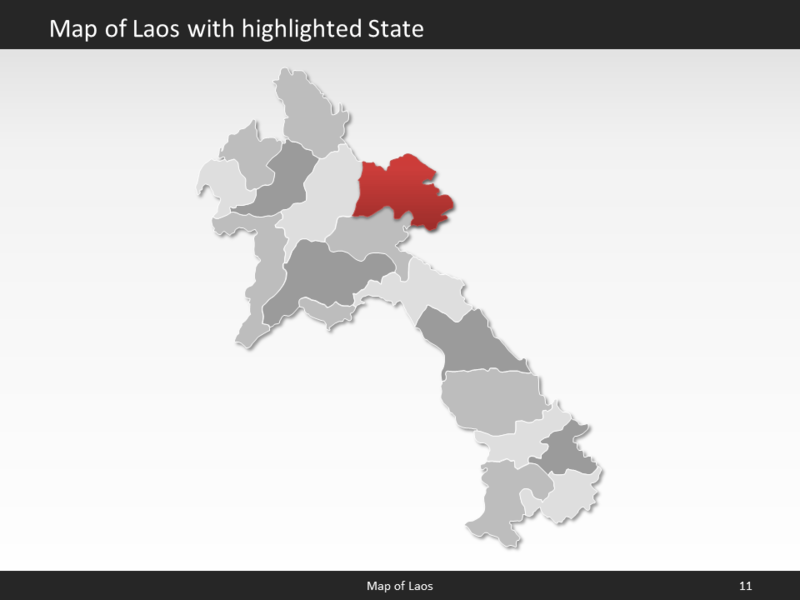 Laos is often referred to as Lao People's Democratic Republic or simply Laos. 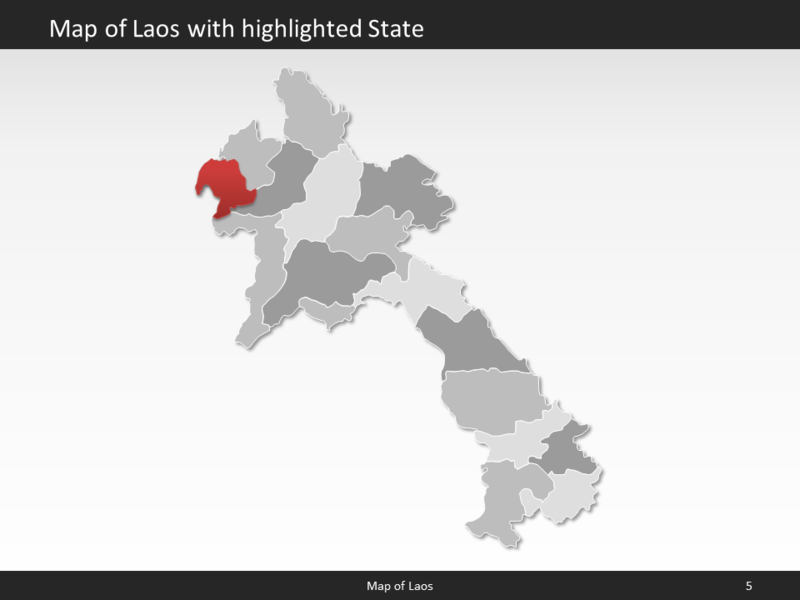 The locals also call the country Sathalanalat Paxathipatai Paxaxon Lao or Pathet Lao (unofficial) for short. 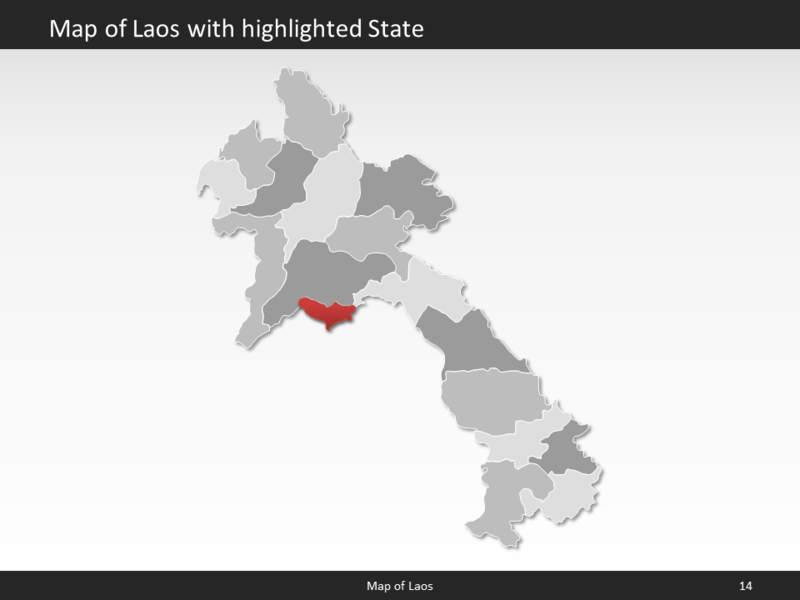 Name means "Land of the Lao [people]". The country's flag has the colors red, white, blue. 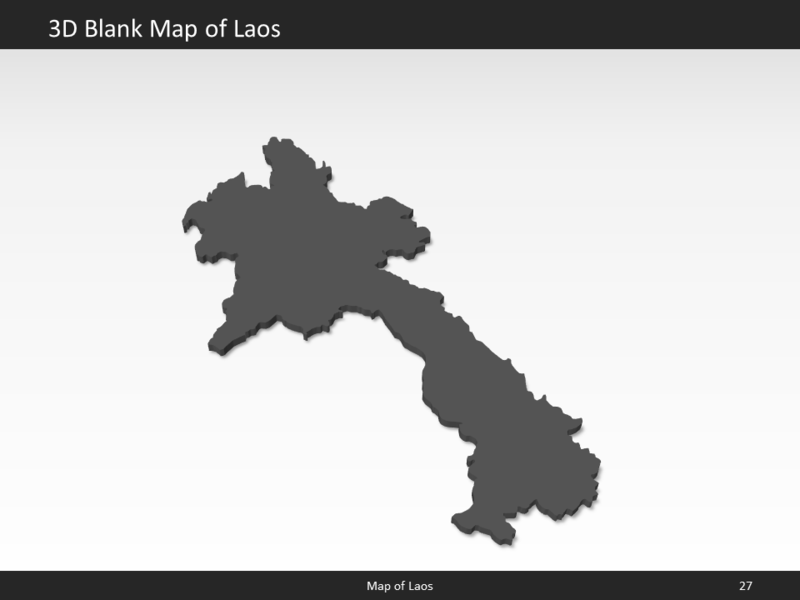 The country of Laos lies 18 00 north and 105 00 east. 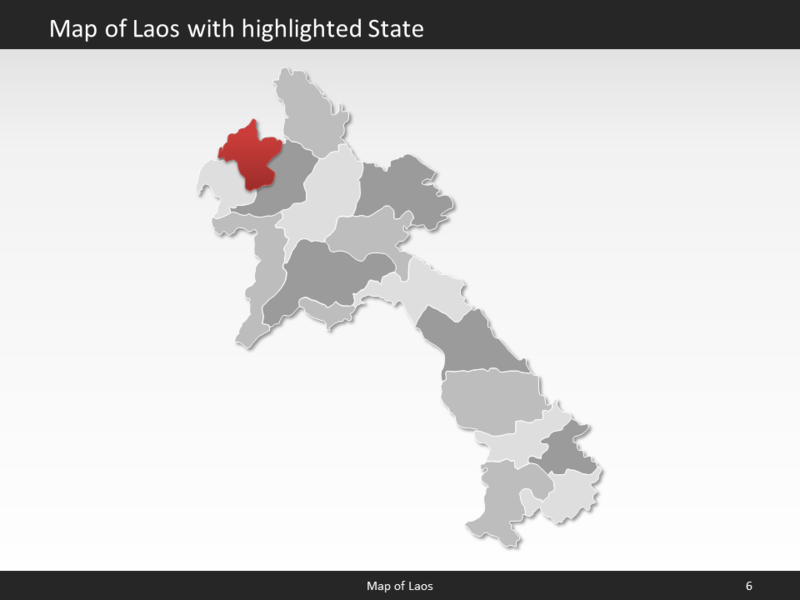 The region has a total area of 236,800 sq km with a land coverage of 230,800 sq km. About 6,000 sq km is covered with water. 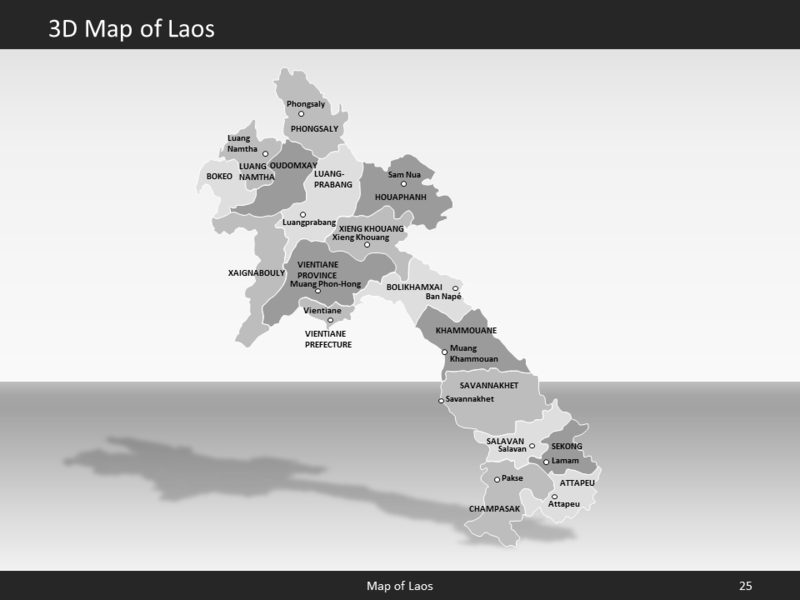 Laos has a total border lenght of 5,274 km and is bordered by the following 5 countries: Burma 238 km, Cambodia 555 km, China 475 km, Thailand 1,845 km, Vietnam 2,161 km. 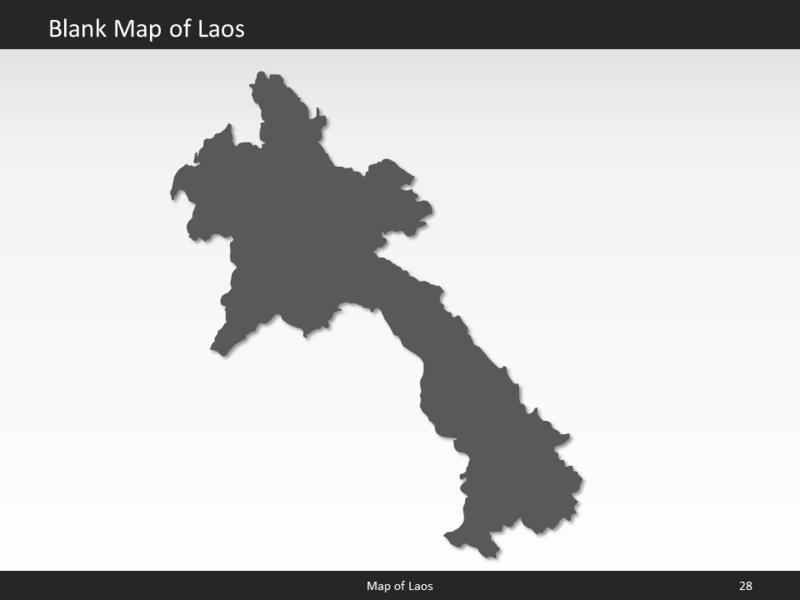 The lowest point is Mekong River 70 m below sea level and the highest is Phu Bia 2,817 m. Its mean elevation is about 710 m. Vientiane (Viangchan) is the capital of Laos and can be found 17 58 N, 102 36 E.
In July 2016 Laos had a population of 7,019,073 people. In 2015, 38.6% of the population lived in cities. The annual growth rate of urbanization is 4.93%. 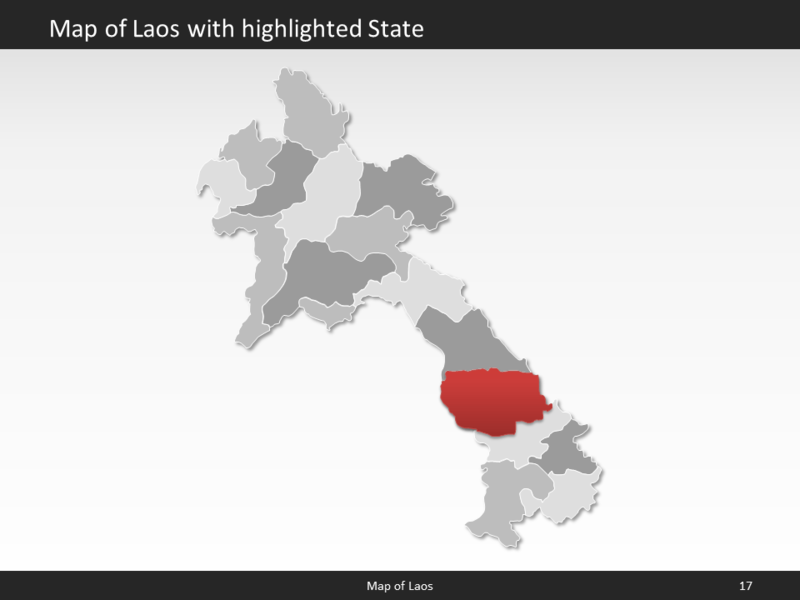 The residents of the country are called Lao(s) or Laotian(s). 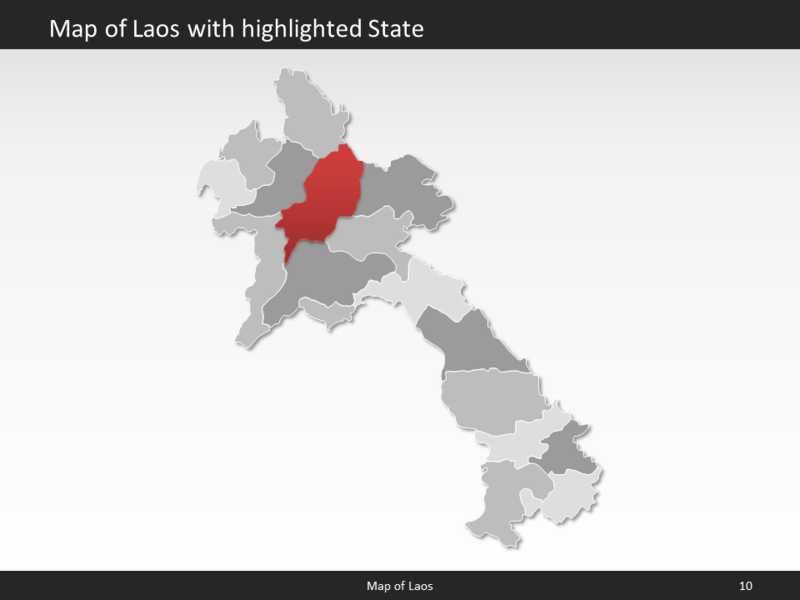 The Lao or Laotian population has a median age of 22.7 years. The median age for males in 2016 was 22.4 years, and 23 years for females. The estimated growth rate of the Lao or Laotian population in 2016 was 1.53%. Looking at life expectancy, the Lao or Laotian people live an average of 64.3 years (males 62.2 years, females 66.4 years). 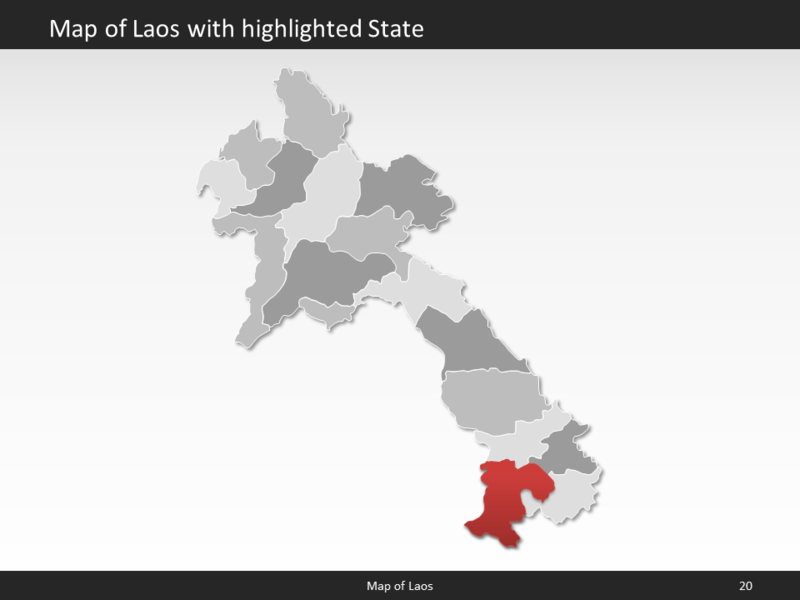 Statistically, Lao or Laotian women give birth to 2.76 children in their lifetime. The estimated gross domestic product in 2015 was about $37.32 billion, with a growth rate of 7% compared to 2014 (GPD 2014: $34.88 billion, growth rate 7.4%; GPD 2013: $32.47 billion, growth rate 8%). 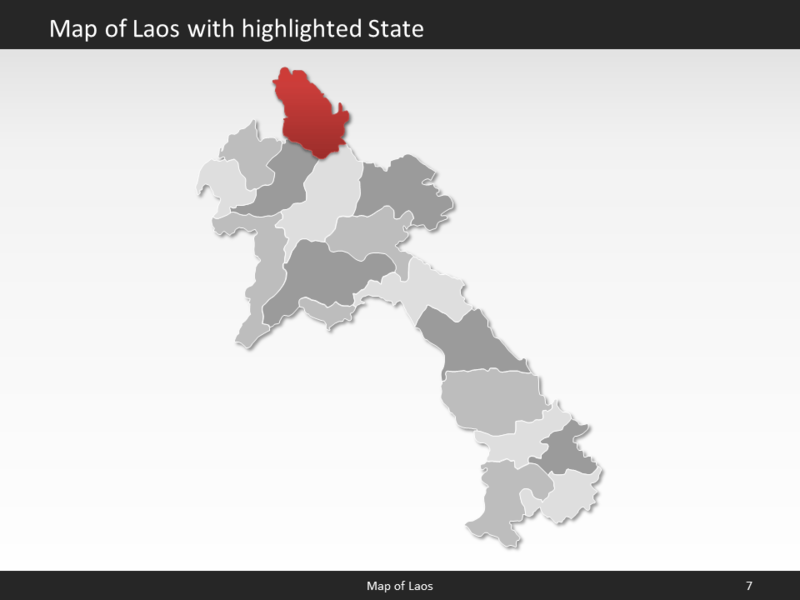 The economic sectors of Laos are: agriculture: 23.1%, industry: 33.4% and services: 43.5% (2015 est.). The country's economy is known for: mining (copper, tin, gold, gypsum); timber, electric power, agricultural processing, rubber, construction, garments, cement, tourism. 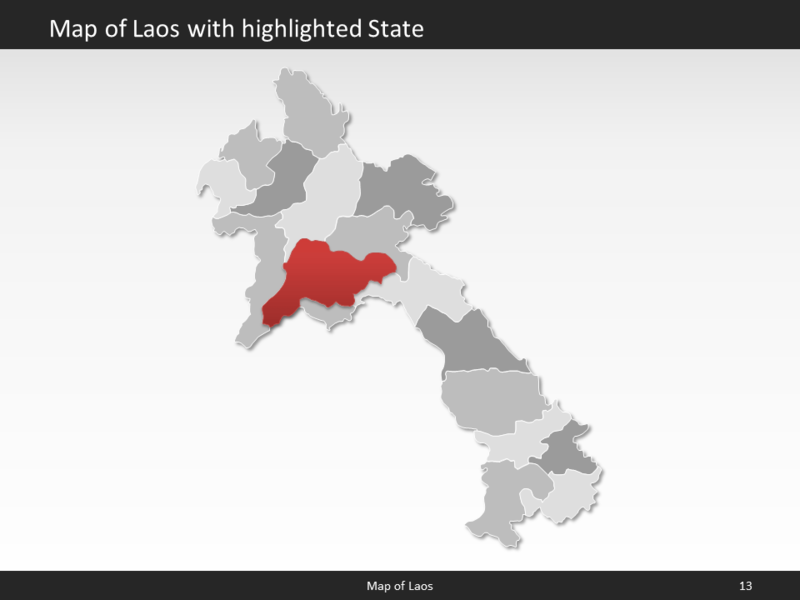 Only 87% (900) of the people living in Laos had full access to electricity in 2013 (rural population: 82%; urban population: 97%). Among those 18.2% (July 2015 est.) or 1.258 million Lao or Laotians, had access to an internet connection.